Chrome Soft Golf Balls combine Tour-proven performance with unparalleled feel and exceptional mis-hit forgiveness. Everything about the ball that changed the ball is better because Callaway has innovated it at every layer, starting with groundbreaking new Graphene Dual SoftFast Core. The result is an extremely fast and soft-feeling ball that promotes high-launch and low spin off the tee for long distance, and incredible shot-stopping spin around the green. The new Chrome Soft is better to its core. Fast Ball Speeds and Low Spin Off The Driver - New Graphene-infused Dual Soft Fast Core with a new, larger inner core maximizes compression energy while minimizing driver-spin and promoting high launch for long distance. Distance and Control Through The Bag - Premium dual-core construction promotes more distance off of your longer clubs, and more control off of mid-irons, short-irons and wedges. Forgiveness - Softer golf balls compress easier on off center hits for incredible distance all over the face. Order with 10 Characters and spaces will be printed in a larger size typeface. 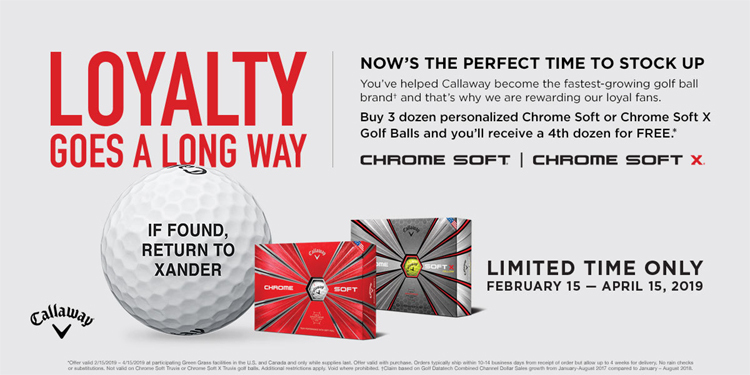 Line Rite (a Callaway Exclusive) is available in two alignment options, target or straight, with up to three initials in black, red, blue or green block letters. All dozens must be personalized with the same imprint and ink color. Maximum one free dozen per imprint/customer. Orders will ship complete with all four dozen. Customer pays all freight charges, including for the free dozen. Simply place your for three dozen golf balls or more and one free dozen will be sent for FREE!! !